Norfolk International Terminals (NIT), US East Coast, is currently taking delivery of the first 6 rail-mounted gantry cranes (RMGs) out of the massive order of 60 new Konecranes RMGs as part of its USD 375 mln capacity expansion project, the Virginia Port Authority informs. This shipment comes as part of the USD 217 mln contract to build and deliver in total 86 RMGs, which the port signed with Konecranes in November 2016 – the largest one-time RMG order in the industry history. 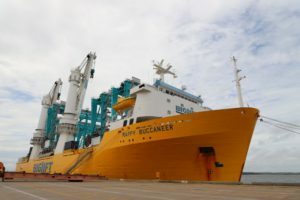 The first machines arrived at Norfolk at the beginning of this week on board the heavy-load vessel Happy Buccaneer. After off-loading, they will be mounted on rails, taken through some minor assembly, tested and put into operation by the end of September, when the first 3 of 30 new container stacks at NIT are ready for use. As we wrote earlier, the Virginia Port Authority is presently undertaking two large-scale expansion projects: at NIT and at Virginia International Gateway (VIG). When completed in mid-2020, these developments will increase the overall annual capacity of the sixth largest container port in the US by 40%, or 1 mln TEU. The expansion of the south container yard at NIT started in January 2018. Within 18 months, the port plans to completely reconfigure the container stack yard, to put into operation the 60 new RMG cranes and thus upgrade the terminal’s annual capacity by 400,000 TEU, up to 1.2 mln TEU. In June, 26 new RMGs were delivered at VIG, where they will support cargo operations in 13 new container stacks.